Intel's push into smartphones over the last 10 years has been well documented, as well as the subsequent downfall after its Broxton smartphone SoCs were cancelled in April 2016. This was not the ‘end’ for Atom in smartphones: an agreement between Intel and Spreadtrum, a low-end SoC vendor based in Asia, kept Intel SoCs going into smartphones for the low-cost market. These chips contained Intel Atom x86 cores, graphics, Spreadtrum modems, and were built in Intel’s fabs. The two chips to come out of the agreement so far were the SC9861G-IA in 2017, followed by the SC9853i at the end of last year. These chips have most found themselves in Senwa phones, specifically the LS9718 and LS9918 that were launched at Mobile World Congress this year, and are in devices primarily marketed to Latin America and Africa. The Spreadtrum SC9853i, the latest SoC to come out of the agreement, is actually the lower end unit. It uses eight Intel Airmont cores at 1.8 GHz, a dual core Arm Mali-T820 GPU (down from PowerVR), a 1080p video engine (down from 4K), and a maximum supported camera resolution of 16MP. The modem inside is suitable for up to 4G Cat 7 / 300 Mbps download. We managed to get hold of the Senwa LS9718 at the show, at the Senwa booth which had a big Intel logo. The booth was fairly devoid of people, or at least, those that were there were not actively engaging with the devices. I only managed to start to have a look around before being pounced on by a Senwa representative from Latin America. He didn’t seem to understand much about what I was doing there as press, and I couldn’t get any more information beyond ‘these are Intel phones’ out of him, but he was happy to stand and watch (at a distance of 6 inches) while I ran a benchmark. The Senwa LS9718 as a phone is a typical super-midrange phone, with a 5.7-inch HD+ IPS screen in an 18:9 format, with 3 GB DRAM and 32 GB storage, and a battery of 3000 mAh. 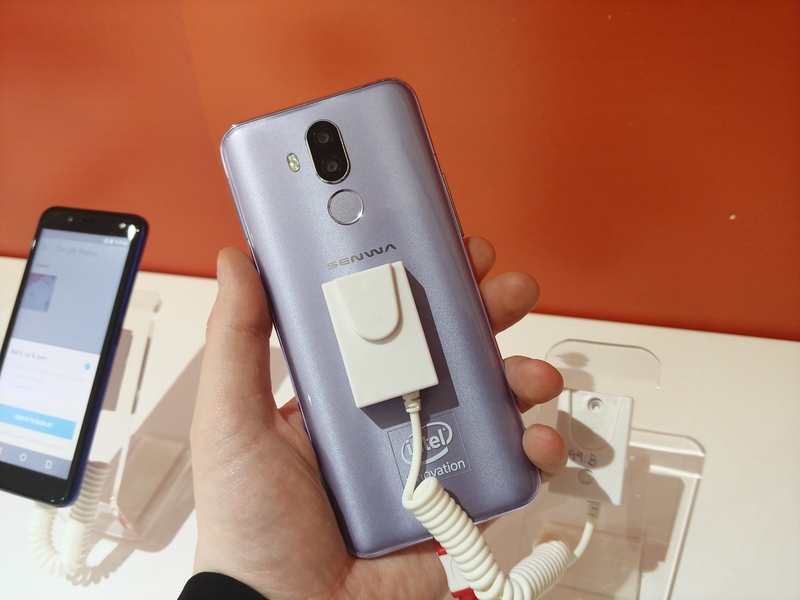 It felt reasonable to hold, it had a dual camera (16MP + 8MP), a fingerprint sensor, and actually kind of felt like an old Huawei phone to be honest. 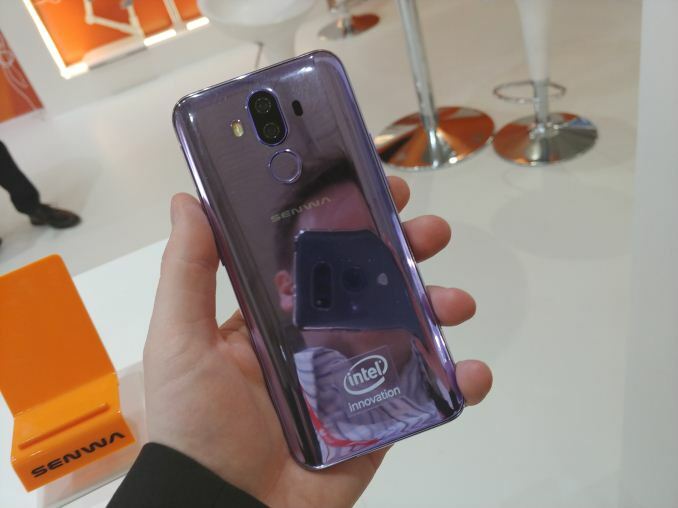 According to Senwa’s press releases, there was also the LS9918 on the stand featuring the same SoC, but with a more premium 5.99-inch HD+ IPS screen. The goal of looking at the device was to actually see what I could get out of the SoC underneath. Intel cores in smartphones are, at this point, a relative novelty. It still relies on Android to be compiled for x86 for example, as well as the intricacies of graphics interconnect and all the usual terminology with Arm based-devices but done in the context of Intel’s large x86 mantra. It is worth noting that the Senwa device was using its native browser, which will lead to some variation. During MWC we also played a bit with the ASUS Zenfone 5, with its Snapdragon 636, an octa-core Kryo 260. That unit scored 45.34 using Chrome in regular mode, and 54.13 in CPU boost mode. 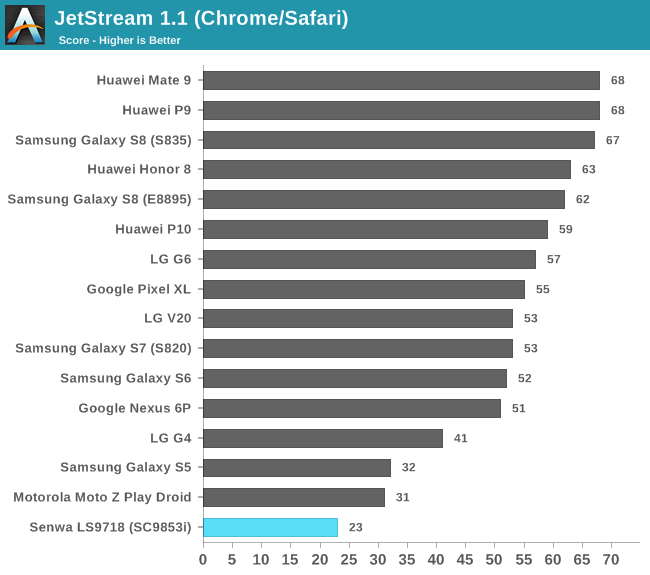 Even compared to the results in the graph above, the performance puts the device well below the LG G4, the Samsung Galaxy S5. The Moto Z Play Droid is a Snapdragon 625, an octa-core A53 configuration up to 2.0 GHz, showing that the Atom cores just cannot keep up. Funnily enough, in between MWC and today, Intel and Spreadtrum have agreed to extend their SoC alliance. The two companies are set to work together to develop SoCs integrating Intel’s 5G modems for deployment by the end of 2019. The difference here is that Spreadtrum plan to use Arm CPU cores, rather than Intel x86 cores. As a result, the SC9853i might be the last smartphone SoC with an Atom inside. 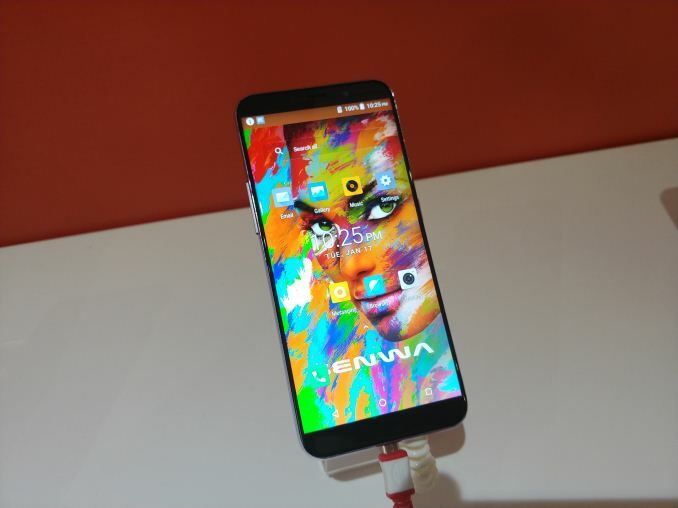 So despite the new launches of devices from companies like Senwa, it is a rather meagre ending to a smartphone processor line that has been on life support for a while. This deal is also odd, given that Spreadtrum normally deals in the low-end SoC space, while 5G will be a premium addition to begin - either Intel is targeting 5G at the low-end as well, or Spreadtrum is gearing up for a high-end SoC, built on Intel's 14nm. Huh. I wonder how much of it is Atom running out of steam as an architecture on modern workloads versus thermal constraints. 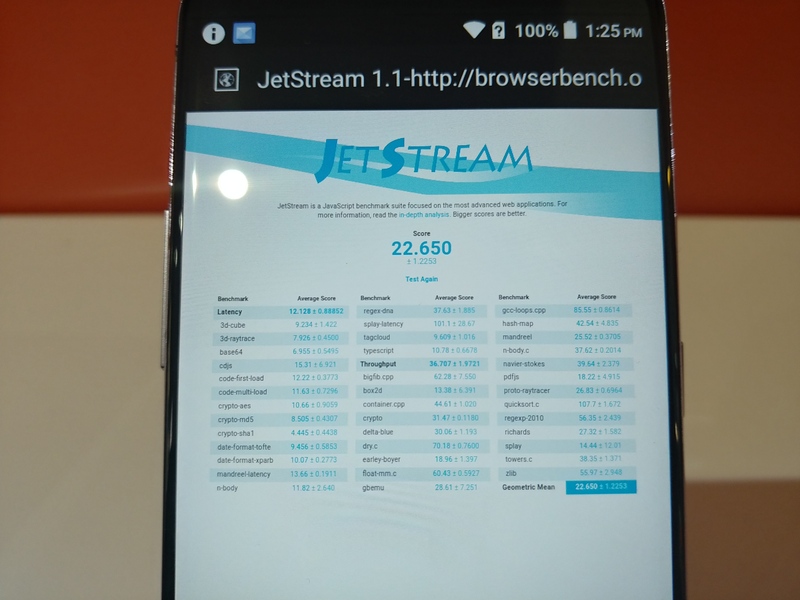 Mid-2015 MBP i7-4980HQ, Jetstream scores: chrome: 176, safari: 259, FF: 198. All tests done in browser with single tab open, rest of system idle. So it's more of a browser than hardware test.. it'd seem. I highly doubt the bad test result really has much to do with the cpu performance. Airmont might not be the fastest cpu core in the world, but there's no doubt it should beat Cortex-A53 cores (even if those are clocked slightly higher). It is still a "modern" out-of-order cpu design (versus the more simple in-order design of the A53). Granted it's a relatively simple and narrow OoO design, which probably should lose to the big Cortex-A cores (A72/73/A75), but it's not THAT bad.